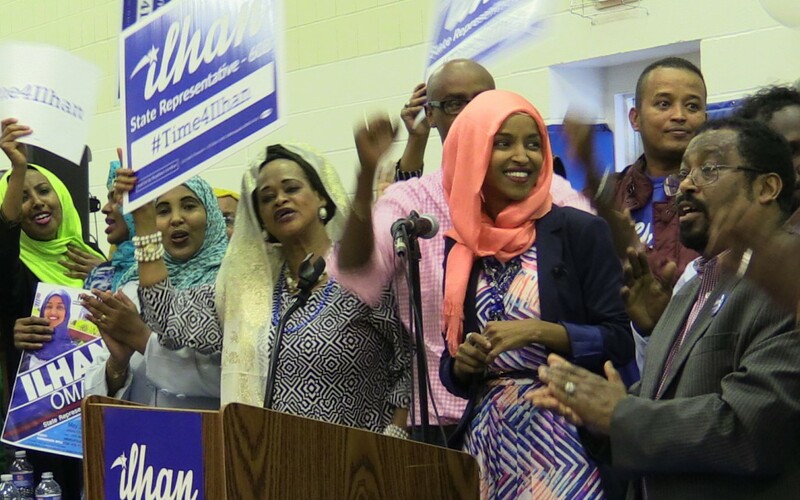 Somali-born politician Ilhan Omar made history on August 9, 2016, when she became the Minnesota DFL (Democratic-Farmer-Labor Party) candidate for the Minnesota House election, defeating District 60B’s long-serving incumbent in the primary. If elected, Omar will be the United States’ first Somali-American legislator. Omar is the subject of filmmaker and former public defender Norah Shapiro’s in-production documentary Time for Ilhan. Screened at the Walker on Thursday September 15, 2016, the film is part of Cinema of Urgency: Local Voices, a showcase of contemporary works by Minnesota filmmakers who connect national debates to specific districts, funding, and infrastructure. In advance of the program, I connected with Shapiro to discuss the film. This is the first interview with each of the filmmakers showcased in Thursday’s program: Remy Auberjonois, E.G. Bailey, D.A. Bullock, Mahmoud Ibrahim and Nathan Fisher, Karl Jacob, Dawn Mikkelson, and Keri Pickett. Before becoming a documentary filmmaker you worked as a public defender. Did this experience shape your perspective about local politics? I’m not sure how much my work as a public defender shaped my perspective about politics, although interestingly, there are many people I know from those days who have risen to great heights in local and national politics (i.e. Congressman Keith Ellison, Mayor Chris Coleman, and many others). I have been politically active/aware since as long as I can remember: I did an internship in high school with St. Paul Mayor George Latimer; I worked for the Mondale/Ferraro ticket in college, volunteered for Paul Wellstone’s magical campaign, and have been a devoted Democrat all my adult life. I actually think it was my politics that led to my becoming a public defender in the first place, which then made me even more aware of disparities, inequities, and the importance of who the decisions makers and power brokers in our society are. My politics also clearly influence the subjects I’m interested in as a filmmaker. You began this project before Ilhan Omar won the DFL primary on August 9. What inspired you to begin work on this project? At the time did you strongly anticipate that Omar would be participating in the November 8 election? I began this project at the end of 2015. My inspiration came in part as a result of a long simmering desire to make a film about the local Somali community, combined with the suggestion by Ilhan’s sister, a longtime friend, that I meet with her to talk about her upcoming race in District 60B. After meeting first with Ilhan, and then with a few key staffers, she decided to grant me access and to allow me to follow her campaign. Although I of course hoped she would make it to the race in November, in some ways that was immaterial, because what I was certain of, was that she was extraordinary, and that regardless of the outcome of this particular race, this was a story I wanted to follow and tell. Could you speak more about the historic nature of this election and primary? I think Ilhan’s win is seen as historic for several reasons. The obvious one is that she will be the first Somali-American legislator in the country, and the first Muslim woman legislator in Minnesota. It’s also historic in terms of the never-before-seen multiracial coalition of African immigrants, liberals, and university students that resulted in unseating the state’s longest-serving legislator, Rep. Phyllis Kahn, after having been in office uninterrupted since 1972. And in the current political climate around immigration, as a former refugee and new American, her rise to office in this climate is clearly also enormously significant. Much of the film focuses on the nuts and bolts of the political process, depicting campaigning and the slow work of building support. What did you hope to reveal by focusing on the on-the-ground efforts of volunteers and campaign managers? The clip that I am showing for Cinema of Urgency: Local Voices is a 10-minute scene cut out of what will end up being well over 300 hours of footage by the time we complete production. We are still in the production phase, which I anticipate will go at least through January of 2017. This is to say that the film in its entirety is not even close to being assembled. In fact this is the first and only scene edited so far. That said, I chose to cut a scene out of the convention day for a variety of reasons, including the focus you mention on the nuts and bolts, as well as on-the-ground efforts, in order to show how steep the mountain is for any newcomer to challenge an incumbent. The teamwork required and the incredible passion and devotion of Ilhan’s staff and volunteers, and how herculean the effort is at this level of state politics to break in. Also, I felt what happened at the nominating convention offered the opportunity for a full dramatic arc without having to set up a lot of back-story, and had some great moments of vérité footage as well as a really nice opportunity to see Ilhan in action. Did you think of your relationship with Omar and her campaign as material that you wanted to include in the film? Or did you always intend to keep yourself strictly behind the camera? I have actually thought a lot about this. I definitely think of myself as separate and independent from the campaign. That was part of the understanding I established from our very first meetings. It’s a question that I found myself having to address at various points throughout production, largely with the other candidates—i.e. clarifying that I was not working for the campaign, that the funding for the project was 100-percent independent of the campaign. That said, I will confess that there have been moments when I wish I was part of the campaign, for example, in terms of what I could have provided in terms of fantastic footage. And I would have absolutely loved to dive in as a member of the communications team, but very intentionally did not, for the sake of the independence of the film. It’s a fine line to walk, and unlike in journalism, it is up to the individual filmmaker to conduct themselves in a way that is ethical, honorable, and truthful, maintaining enough distance and independence to ultimately tell a story that is not a commissioned, propaganda piece, but also allows for developing the relationships, intimacy, and trust that result in the kind of access necessary to be able to ultimately create a satisfying documentary story that has depth, authenticity, and intimacy. I definitely intended as much as possible to keep myself behind the camera, but I see that as a completely separate question from that of independence and ethics. It really is more of a stylistic, creative choice, and maintaining independence from the campaign is a separate question. Whether a director appears in the story or stays behind the camera, their footprint is always there. There is no such thing as an objective documentary, given all the choices, inclusions, exclusions, the way the content is woven together, where a story starts and ends, to name just a few of the almost infinite variables. This year there has been tremendous focus directed towards the presidential election. What do you feel is lost when national elections dominate the news? Did you hope to raise awareness or interest in local elections with this project? I wanted to raise awareness about an extraordinary candidate’s attempt to enter the political sphere and about the barriers that would need to be overcome in order for her to win. Frankly, I will not be at all surprised to one day see Ilhan on the national stage, but the local level is where almost all politicians start, and I wanted to document her attempt to enter the arena. I am a huge fan of Marshall Curry’s documentary Street Fight, which follows now-Sen. Corey Booker’s attempt to become Mayor of Newark, New Jersey. I saw Ilhan’s story as offering a lot of similarly compelling storytelling opportunities, for a similarly charismatic and brilliant rising political star at the beginning of her career. I definitely was also interested in showing what is involved at the local level, not to mention the opportunity to present a positive, stereotype-busting portrait of a Muslim immigrant woman in politics, particularly in the shadow of the rhetoric in the presidential arena coming from the Republican candidate. What specific stereotypes did you set out to discredit? Do you think the national focus on the presidential election neglects the diverse coalitions that engage in the political process every day? There are negative stereotypes abounding in our popular culture at the moment, about immigrants and refugees, and especially about Muslims and Muslim women in particular, as being oppressed, without agency, without voices, to name a few (just look at Donald Trump’s attacks on the Kahn family). I believe that the rhetorical vilification of Muslims in the current presidential election cycle is contributing to an already hostile environment for Muslims in America, with consequences that are increasingly becoming not only discriminatory but also violent, with an unprecedented rise in hate crimes against Muslim, including Muslim women, since 9/11. Additionally, in pop culture, and certainly in American films, Somalis—including the Minnesota Somali community—have often been portrayed as violent extremists. Independent of the question of stereotype-busting, the film’s exploration of the Ilhan campaign’s on-the-ground, local, and grassroots–level operation and strategy, and the folks who are involved and welcome, will also offer inspiration for viewers who might feel that American democracy, for example at the presidential level, is beyond their reach and inaccessible.